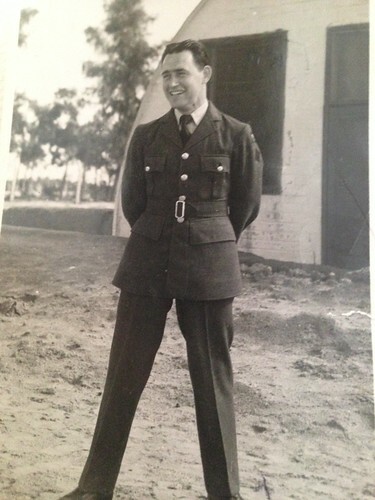 My father in his early days in the RAF. Dad was born in Canon Street, Kirkintilloch, Scotland in 1928. Brother to 5 sisters, he knew little of his mum (she died when he was 6 years old) and was brought up by his older sisters Cathy and Barbara (Babs), whom I knew very well as child. Cathy later joined the NAAFI, Babs being married, was not eligible to Join up. Dad’s father, worked in a steel foundry making moulds and with long hard hours, my father spent little time with him, but what time was spent, was precious and enjoyable. He lived in the suburbs of Kirkintilloch, his bedroom window overlooking the rail yards behind. He would watch the steam engines shunt wagons to and fro taking coal to the nearby industrial capital Glasgow. Alongside these yards were the now dying canals. Still seeing the odd canal boat, he would amaze at their slow speed compared to the new and exciting locomotives that enthralled all young boys of that age. Dad’s life was tough, as was most youngsters growing up in pre-war Britain. The thirties were a time of poverty, hardship and the impending war must have paid a high toll on many a man as the thirties led into the forties and the second world war. For my father however, this was a time of some excitement. He recalls standing on the Campsie Hills, watching the Glasgow Blitz, bombers flying in over his head on their bombing run using the Clyde to guide them. The red skies, exploding bombs and burning homes, only second the to the drone of enemy aircraft and Ack Ack fire as the search light fingers thrust deep into the dark skies searching out their prey. Too young to be in the war, he became fascinated by flight and machinery. He would build model aircraft using old bits of wood, a penknife and magazines drawings of the latest modern fighter. Leisure time was taken up with fishing in the local rivers – many times with my grandfather. Dad also looked after the rabbits that he often entered in local shows or simply watch the locos trundle up and down the tracks behind his house. A simple life. Once leaving school he became an apprentice in a switch gear factory, left there and joined the local nail works. After that, at 17 1/2, the RAF beckoned and he volunteered for service. Posted to the training camp RAF Wimslow, he spent the first 6 weeks on basic training and ‘square bashing’. He was never one for marching round and round and did not particularly enjoy his time here. 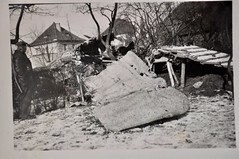 One clear and abiding memory he does have of this, was his first encounter with a Luftwaffe fighter, an ME 109(E) that had been left in a local scrap yard. Here at Wimslow, dad completed a flight mechanic’s course, that used his interests and skills and this would lead him onto the engineering side of the RAF. Finally, 9 months later, he was posted to Wig Bay, Stranraer. 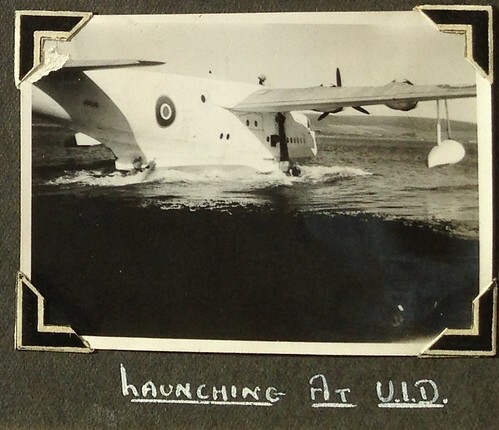 Launching a Sunderland at U.I.D. 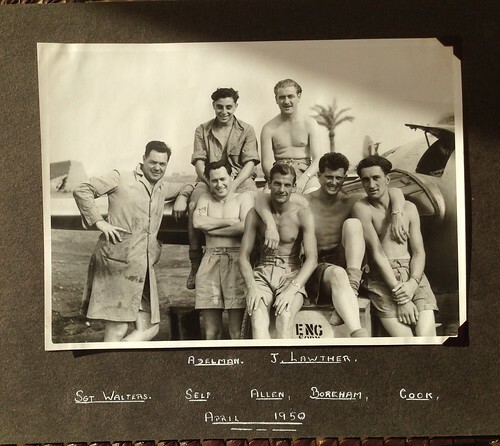 Moving up the career ladder, my father was posted to Weston Super Mare where he completed a Fitter’s course before returning to Wig bay for a very brief spell and then his first ‘real’ posting – Egypt. 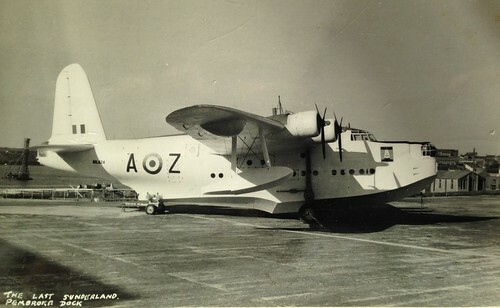 The last Sunderland – Pembroke Dock. During he late 1940s and early 50s, there was much unrest in the middle East, and British forces were sent to the region as ‘Peace Keepers’. Whilst in the Middle East, dad found himself in Egypt, Iraq, Trans Jordan and the Persian Gulf. This was his first and only real taste of war. Dad’s arrival was not a pleasant one. Flying in by Dakota, the huge change in temperature hit him hard forcing him into hospital on arrival. A short stay and his first experience of Egypt was over. Dad outside the main gate. 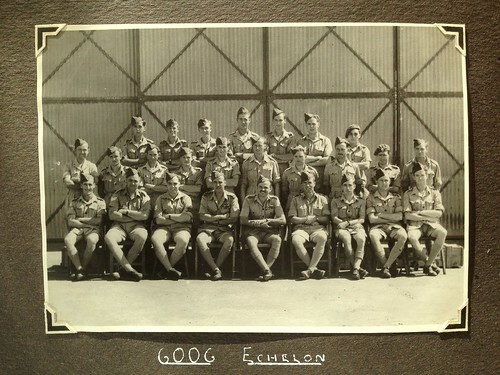 My father’s first posting placed him in 6006 Echelon serving 6 Squadron flying Tempests. Alongside 6249 and 6213 Echelons, with 249 squadron and 213 squadron, each flew Tempests and had a Harvard used for returning downed or crashed aircrew as quickly as possible ‘back in to the saddle’ before fear took over. The old adage about getting back on a horse springs to mind. Often visited by other ‘local’ squadrons, he regularly saw transport aircraft and fighters, especially Spitfires, land for more fuel or exercise / training. The job of many of these aircraft was to fly the border regions preventing Israeli aircraft from entering opposing airspace. On one particular flight, from Cyprus, a squadron of Spitfires went ‘looking’ for predators only to find their guns had not been cocked and so useless in battle. The determined Israeli Pilots downed 4 RAF aircraft with the same Spitfires that had been fighting alongside them only a few years earlier. A tragic loss that left a mark on many people that particular day. 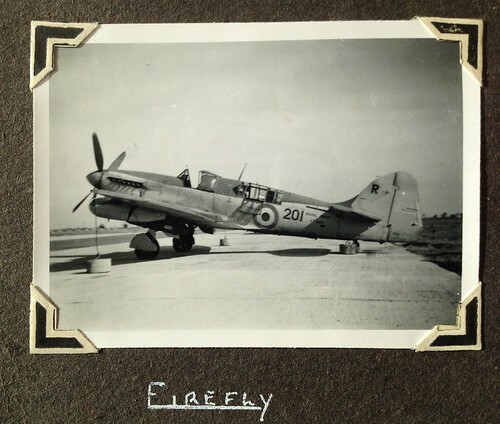 Other visitors seen at the airfields during those times included examples of the Royal Navy – Fireflies and Sea Furies, along with a variety of: Ansons, Valettas, Dakotas, Hastings, DH Rapides, Skymasters, Brigands, Doves, and the odd Viking. A wide range of now ‘classic’ aircraft. As a fitter, my father had many jobs to do, and repairing damaged aircraft following ‘prangs’, training or missions was not uncommon. One regular job was repairing radiators of Tempests following strafing runs over targets. Flying in-line, they would fire they 5mm guns and pull up to avoid damage and ricochets. 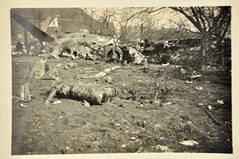 However, following aircraft were not so lucky and would often be the subject of these ricochets. The shells would hit the target and bounce off into their radiators. 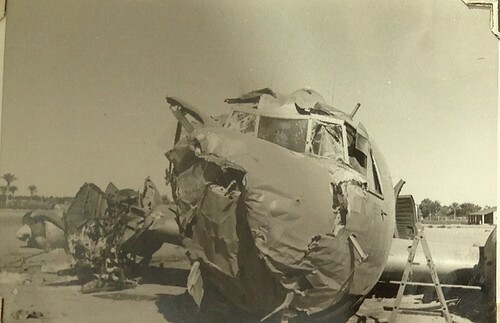 This became a common incident along with damaged leading edges where aircraft had flown into the stray shells. Dad would remove strips from scrapped Tempests reshaping them and then rivet the new part to the damaged wings. 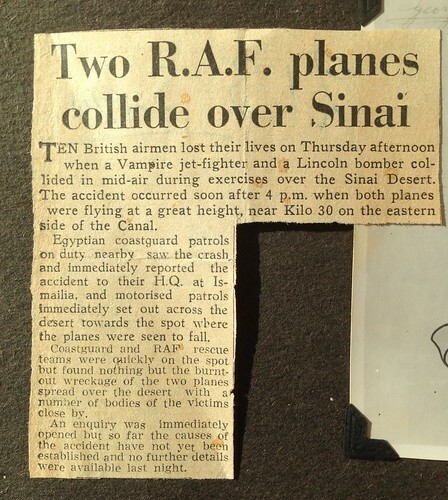 News Cutting Reporting the Collision Over Sinai. 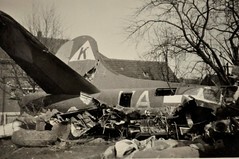 Prangs, battle damage and accidents were not uncommon. One major accident occurred on a Thursday afternoon – the year is unknown. 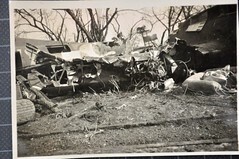 A Vampire and Lincoln bomber, ten airmen in total, lost their lives following a high altitude collision on the eastern side of the Suez, a tragic accident. Landing on desert sands also proved to be very difficult. Runways carved out on hard sand were not always available, and trying to land a fighter on the softer sand proved fatal on several occasions. 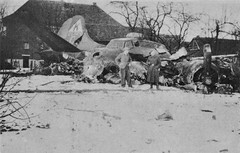 A prang involving a 249 Squadron Tempest, saw Pilot Officer Watson killed after his undercarriage was ripped off and the aircraft burst into flames. Whilst in the Middle east, dad had the privilege of meeting King Abdulla of Jordan and his bodyguard on a Royal visit to the airfield. He also had a rifle pointed at him for photographing a rather new RPAF Attacker. He also saw a number of different Iraqi aircraft following visits to the airfield, whilst building relations with the RAF. Dad would spend much of his ‘leisure’ time along the banks of the Suez Canal watching a range of naval vessels on their passage through. Many large and active warships would traverse the canal including HMS Triumph and HMS Belfast. HMS Amythist also passed this way following the ‘Yanste incident’. 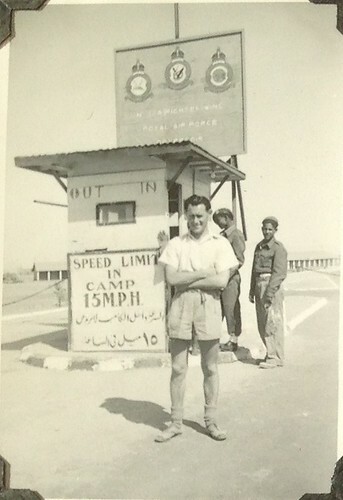 Once dad’s Middle Eastern posting came to an end, he was sent back home to his native Scotland being posting to an airfield near Arbroath. Here he returned to carrying out inspections of Lincoln Bombers, now old aircraft awaiting their fate whilst the new Vulcans and Victors took over role of the modern bomber. A short time in Scotland preceded the ending of his RAF career. Being moved to Lincolnshire, RAF Swinderby, he would again experience the odd Wellington bomber but primarily Varsities used for advanced crew training. Here crews would take off performing ‘circuits and bumps’ followed by walk round inspections by trainee Flight engineers. Often carried out at night with a small torch, these were common place and often without incident. However, one tragic night saw a trainee Flt Engineer walk into a spinning propeller, needless to say the airman concerned did not survive. Dad was moved about in these last few years. Next stop was RAF Manby, on the East Coast of Lincoln. Trips to nearby Lincoln City encouraged his photographic interest’s and his albums contain numerous photos of this beautiful part of the country. 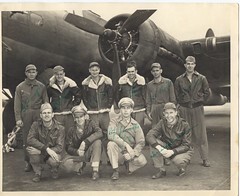 Lincoln bombers again became the focus of his work, many of these being used to fly to the Middle East. A short stay at the developing satellite station at RAF Strubby saw him working back with the Meteors he had first became acquainted with in the Middle East. The trainer version Mk 7s, the new ejector seated Mk 8s and photographic reconnoissance version Mk9s being the main types here. 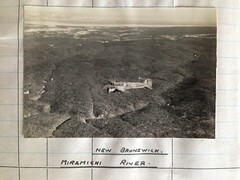 Whilst at Strubby, dad experienced the Canberra, poised on the far side of the airfield, ‘ordinary’ personnel were not allowed anywhere near these aircraft. Painted in black with red tips on the tails and wings, the purpose and identify of these remains a mystery today. Being rather sceptical, my father believes these were used for photographing Moscow by flying over the North Pole as the Cold War warmed up. There are records of North Pole flights being undertaken at this time using very similar Canberras. Dad and the Crew April 1950. On returning to RAF Manby, dad was demobbed (1956) ten years after joining up. He sent all his equipment back home before it was ‘confiscated’ by the authorities in an attempt to prevent communist infiltrators from reporting back to the mother land! This was unfortunately ‘disposed’ off by his sister before he could return. Looking back he talks of many events that occurred with great detail, others with a little less and perhaps even a little embellishment, but these are his memories and the inspiration behind my love of aviation and old airfields once inhabited by heroes and romantic tales of flight. 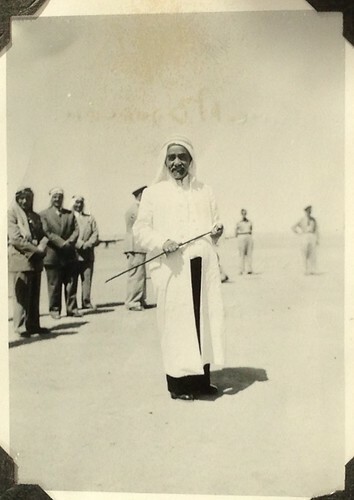 Some of my father’s photos are in my Flickr account, most were taken during his time in the Middle East. Feel free to browse, you may know some of the places or people shown. Please let me know of any memories you may have of this time. N.B. Dad sadly passed away at the age of 89 on Monday 25th June 2018. What great memories and photos you have of your dad. Quite an inspiration, to be sure! Thank you Mary. He is now 89 and getting rather frail. I just hope I was a good a dad as he was. Thank you. Very simply, he’s my dad. Thanks for sharing your trails. 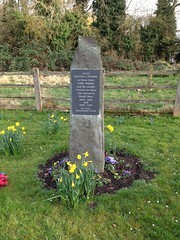 I worked at Bitteswell in the 1970s and also Dad was with the AWA/ Hawker Siddeley Company at Baginton and Bitteswell. There is a Facebook page that I admin called BITTESWELL and as you have memories of the old place , you may find some of the hundreds of images on the pages , of interest. Thanks. Paul. Thanks for looking Paul. I do have fond memories of watching the aircraft fly around Bitteswell, I shall take a look at the site and see what I can find. Thanks for letting me know, Andy. 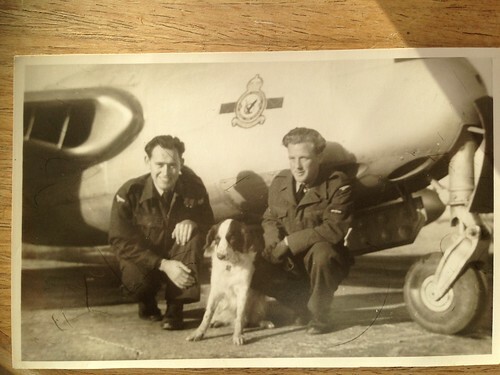 Andy, what a beautiful story of your dad, his life and service in the RAF. He really did give you a gift – your love of aircraft, airfields and history. How is he doing and what does he think of your tribute? He must be nearly 86. Please thank him for his service again. How great he had the mechanical and engineering skills in a country literally defined by aircraft. Great job Andy. Thank you Fran. He is indeed nearly 86 and still talks with pretty good accuracy about these times. His short term memory is now very poor and conversations tend to be the same over and over. I try to get home to talk as much as possible about the ‘old times’ to keep him stimulated. He always fancied the title Air Commodore Peter Bryson Laing – I must admit it does have a special ring to it. His sisters are all now passed on, the last two, those mentioned in the piece, dying in the last few years. This really upset him as it was they who raised him. Since losing my mum, he has deteriorated and the smile he always had is fading. Other than that he is generally ok. Doesn’t get out at all other than shopping or the library, but loves watching westerns and reading. ‘ The library has run out ‘ he always says with a new pile of books. All he wants is to be at peace with mum, they were married for 50 years and he adored her. A lovely man I shall miss him.